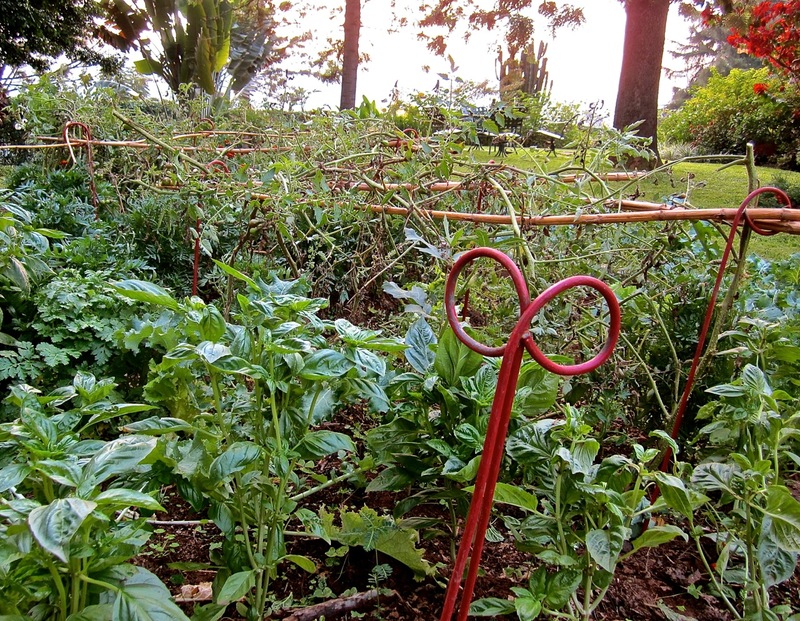 I just wanted to show off the plant supports that a local craftsperson recently made for the garden from my “design.” They’re cut and bent from lightweight rebar, and he gave me two sizes — about 30″ and 5′. Two plant supports in foreground, back to back. 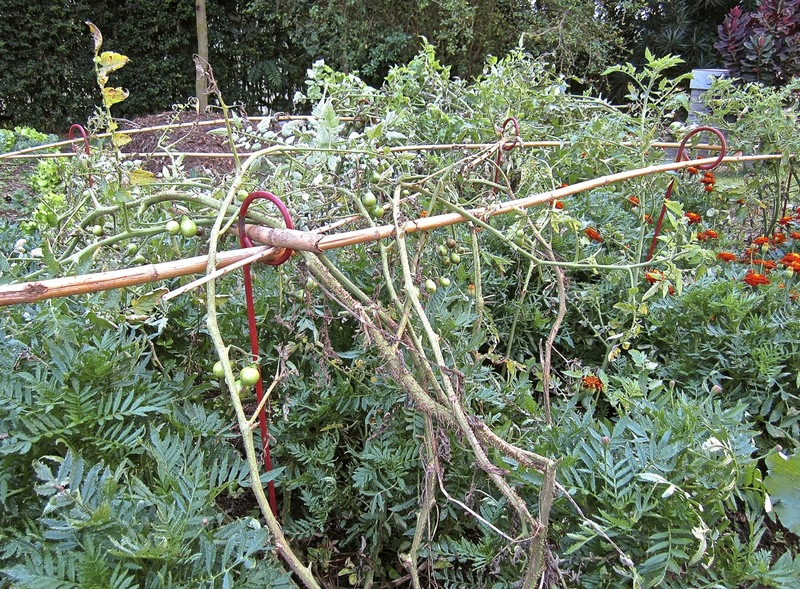 I can tie plants directly on to them, or I can slip bamboo poles through the loops to make a supporting grid. They’re much easier to push into the ground than bamboo or wooden poles, and they should last pretty much forever. 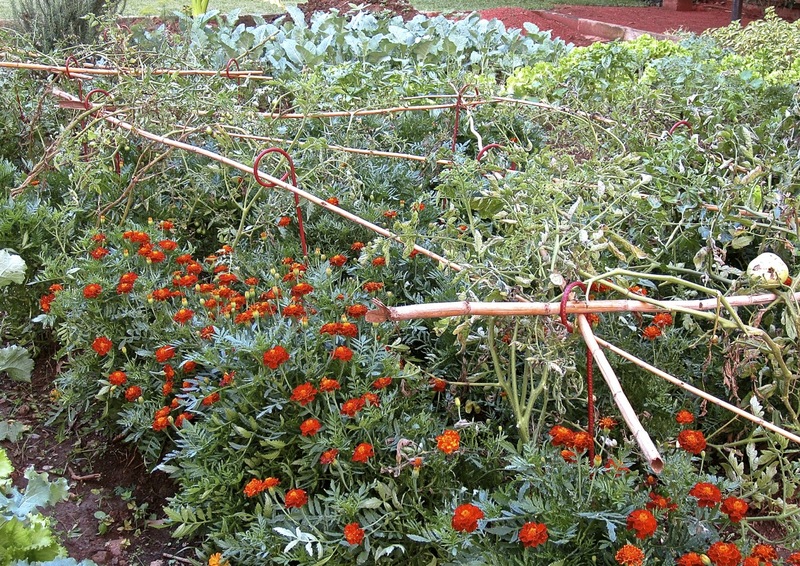 Plant supports and bamboo grid — with my sorry-looking tomatoes. Painted reddish-brown (more brown than they look in the photos), they’re unobtrusive in the flower beds. But I think they would also be fun in really bright colors. Previous Post Pinned . . . Pretty and useful! The perfect combination! They look great in your garden. Smart design! Thanks! I already need more of them. I think it’s #3 or #4 rebar. Great idea and design. “Sorry looking” tomatoes? That sounds like Southern vernacular to me! It’s either from the Texas or Virginia side. All my country ancestors would be shaking their heads that I failed with yellow pear cherry tomatoes. I do have lots and lots of kale though. Well, it’s not a rookery. . . but they’ll keep things upright.